After nine years of operating in a quiet corner away from prying mainstream gaming eyes, the PlayStation 2-based EverQuest Online Adventures will cease to be come March 29, along with Cosmic Rift, Infantry and Star Chamber: The Harbinger Saga. Let us read up on these games on Wikipedia and then have a moment of silence in their memory. Of course the game wouldn't have operated for nine years without a passionate, dedicated fan base, like reader Jason, who passed along the tip. He was just playing the game last night, and was shocked and disappointed by today's announcement. "I was just raiding the Plane of Disease with my guild last night as well as the Plane of Sky and we had 25+ people at both raids, in addition to a sub group that split off late night to do some lvl 60 quests. I work full time, own a house, have a girlfriend etc..., so this isn't some crazy loner who lives at home and has nothing else to do. (well crazy maybe...) I had to attend work meetings at 7am and we were "tanking and spanking" hard hitting raid quality mobs past my adult bedtime and well into the "girlfriend aggro' zone. " While I'm surprised to hear the game was still that active, I can certainly understand the sadness that comes with an MMO closure. I bought a PlayStation 2 hard drive years ago in order to play EverQuest Online Adventures, but as a PC player of the original EverQuest I couldn't get used to not having a mouse and keyboard, and couldn't be bothered to search for a console-based solution to that problem. 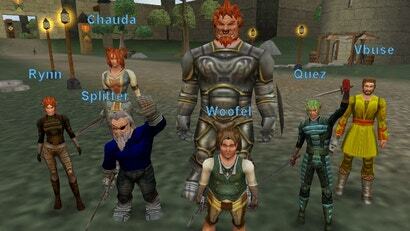 So where do the last great PlayStation 2 MMO gamers go? SOE is granting them three months of Gold access to EverQuest and Everquest II, both games they probably would have been playing anyway had they wanted a non-console MMO. There's always Final Fantasy XI, but it's not quite the same thing. Perhaps they'll upgrade to the PlayStation 3 and hop on DC Universe Online, though with the bad taste left in their mouths by Sony Online's measly one month notice, I don't see that happening. No, the EverQuest Online Adventures players will likely move on, disappearing back into the crowd they emerged from years ago when the game's commercial declared "It's time to slay the dragon!" Melancholy, The end of a world however small and transitory. Do not go quietly into the Night, Everquest. Have a party up till the final moment. RIP Sweet sweet game I know nothing of and care little of. Sweet dreams.